DUMBARTON ended the first quarter with a humiliating 3-0 home defeat at the hands of Ayr United. DUMBARTON ended the first quarter with a humiliating 3-0 home defeat at the hands of Ayr United in a match vital to their surviving in the Ladbrokes Championship. Ian McColl's men grabbed a very early lead when Sons lost the ball in midfield. Gary Harkins forced a save from Alan Martin, but Alan Forrest was on hand to tap the ball home from the rebound. It took Sons some time to get going after this initial blow. 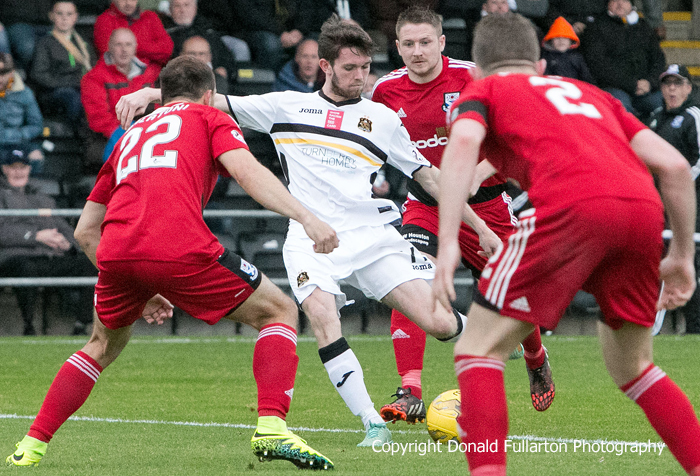 Josh Todd had a couple of chances, but by half time the score was still 1-0 to Ayr. Andy Stirling replaced David Smith for the home side at half-time, as Stevie Aitken's side came out determinedly looking to reverse the misfortune of the opening 45 minutes. Sam Stanton (pictured), Joe Thomson and Darren Barr almost scored for Sons during a bright start to the second half. However, it was Ayr who pulled further ahead when Martin, out wide, lost out to Harkins, who squared to Forrest for a too-easy second goal. On the hour United effectively wrapped up the victory with a penalty, and Forrest's hat-trick, after ex-Son Nicky Devlin was fouled by Daniel Harvie inside the box. Before the end Thomson headed over the bar for Dumbarton, but Ayr also had opportunities to claim a fourth. For the first time in many months, the home fans booed their team off the park.